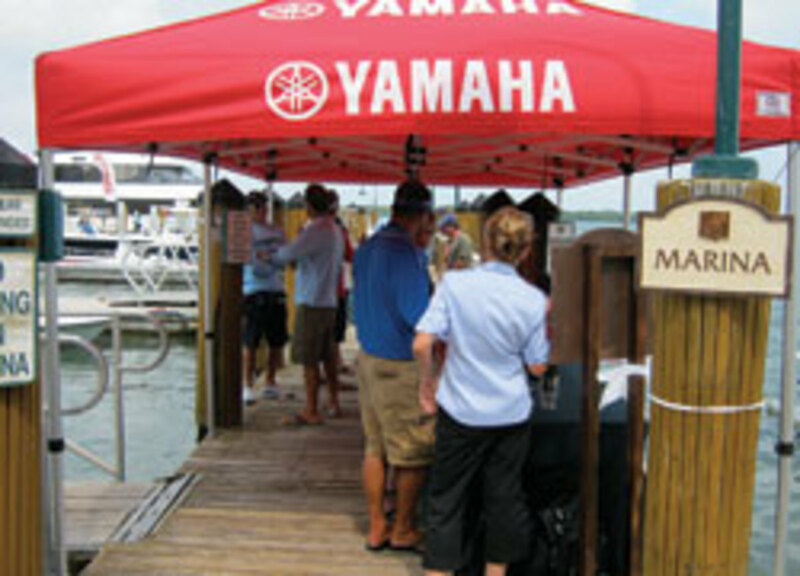 About 20 journalists gathered in southwest Florida for the Yamaha Marine Group summer media event, where they tested boats from 16 to 35 feet powered with Yamaha outboards from 70 to 300 hp. Yamaha also invited to the three-day event the professional anglers behind the National Geographic Channel TV series “Shark Men” to promote the durability, endurance and low maintenance of its engines and control systems. “The reason for getting the Shark Men involved is that they have such an excellent story to tell in that they use our product really hard. They’re unforgiving in the way they use the product,” Yamaha communications manager Martin Peters says. Inviting the Shark Men is an example of Yamaha’s alternative marketing efforts to attract more journalists to its media events, Peters says. The anglers, who catch and release sharks to collect data that may help increase survival rates, use two boats with Yamaha power: a 21-foot Safe Boat with twin F115 4-strokes and a 23-foot Contender center console with a pair of F250 4-strokes. 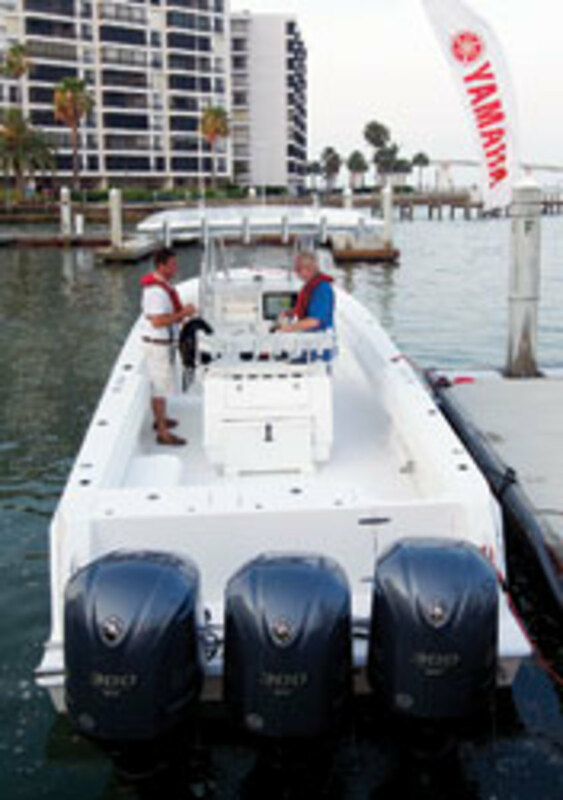 The June 14-16 event was held at the Sanibel Harbour Marriott Resort & Spa in Fort Myers, Fla., and Yamaha engineers were on hand to run the boat-engine packages with the media and provide technical and test data. Yamaha showcased its V-6 offshore engines, which include 225-, 250- and 300-hp models. 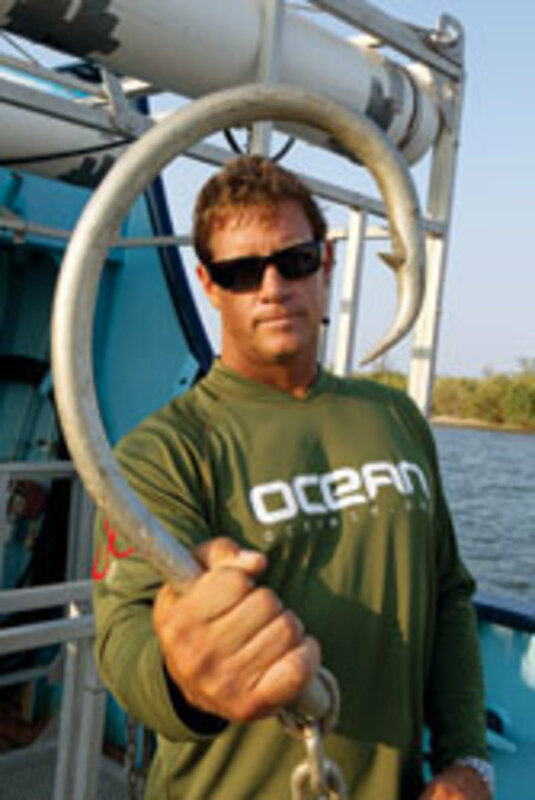 The media also had an opportunity to interview the team of fishermen and researchers led by Chris Fischer, the man behind the television show and the founder of Ocearch, a non-profit organization that researches large marine species such as the great white shark. I ran the Safe Boat with Wagner, who threw the vessel into 40-mph doughnuts and sharp turns to demonstrate its tracking and maneuverability. The other boats on hand were two Rangers (a 168 Phantom with a Yamaha F70 and a Z518 Intracoastal with twin F200s); a Maverick 17HPX with an F70; a Nautic Star 2200 with F250s; a Shearwater 23TE with an F250; two Skeeters (a ZX 20 Bay with an F115 and a ZX 22 Bay with an F250; a Scout 251 XS with an F300; a Pursuit ST310 with twin F300s; and a Contender 35ST with triple F300s. We also took tours of Fischer’s mothership, Ocean, a former Bering Sea crabbing vessel, which was anchored just outside the resort’s marina. The anglers use a crane to haul sharks aboard Ocean after they’re hooked from the smaller boats. Arranging Ocearch’s involvement in the event was easier than expected, Peters says. “We knew they were going to be doing research on the hammerhead shark in Boca Grande Pass, and Sanibel is in close proximity, so it worked out nicely,” he says.